A bar blade (also known as a speed blade) is a tool for quickly popping off bottle caps. It is a thin strip of metal (usually stainless steel) with a hole at each end, one for your thumb and the other to open the bottle. Bar blades are strong, durable and often used by professional bartenders. You can even do tricks with them! 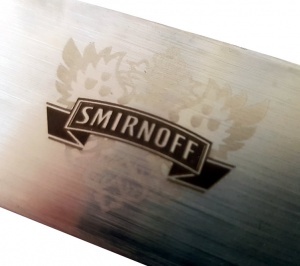 This Smirnoff branded bar blade bottle opener has a brushed stainless steel finish and is ideal for commercial or home use. Wholesale and bulk buy discounts may be available on these bar blades subject to required quantity. Please call us to enquire.